Boston city weddings always provide a unique challenge when trying to find creative ways to make it seem like the bride and groom are the only ones in the area. At the Christian Science Center in downtown Boston there is a great area with a row of trees. In the winter they light these trees up for Christmas and in the spring and summer they are a pretty green that creates a sweet little tunnel. I only wish I had more time to photograph the couple here. This was taken in between shooting family formals and waiting for the limos to arrive. What you don't see in this photo are the hundreds of people gathered on both sides of the trees watching the couple have their photos taken. Taking photos in the city of Boston can be nerve wrecking if you are shy. I always joke with clients that they didn't realize they were going to be famous. 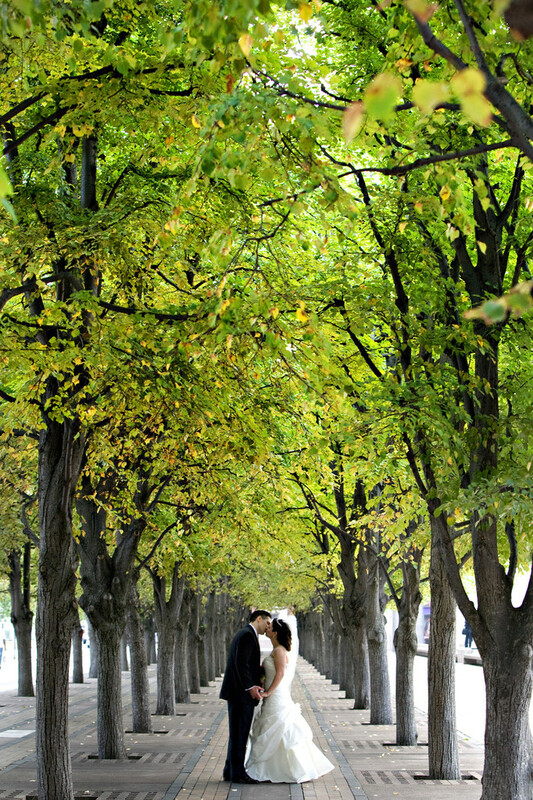 This image has always been one of my favorites because of the green trees and the symmetry. At the end of the day if a photo is off just slightly, or not balanced, it will drive me bonkers!